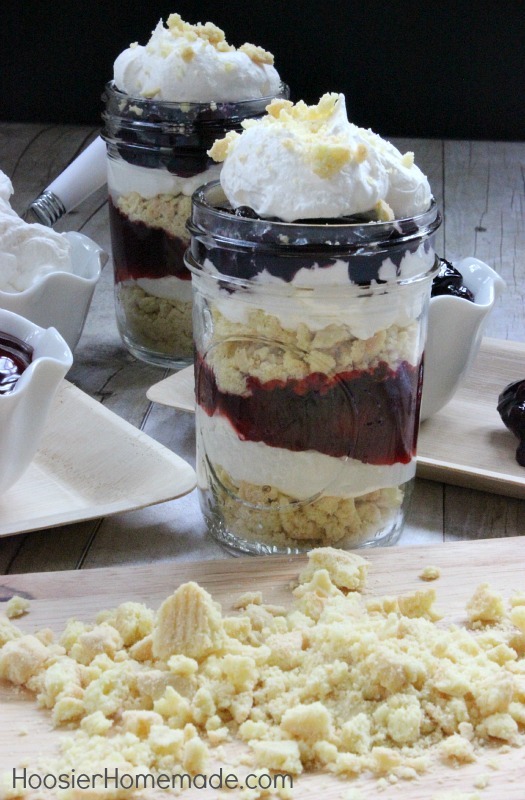 During the hot Summer months, there is nothing that I like more than to create and serve a no bake dessert. 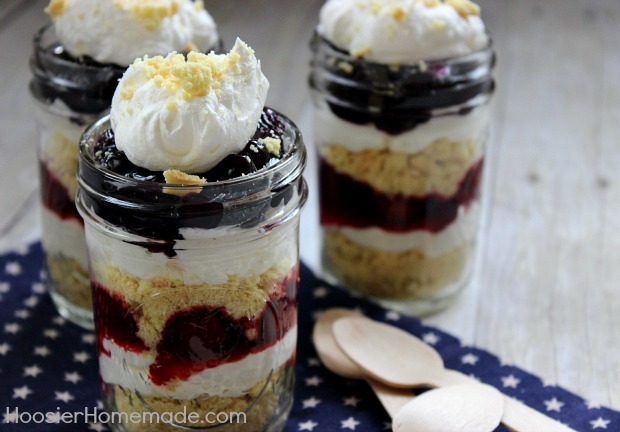 These No Bake Cheesecake Trifles are perfect for any time of year, but especially right now for the Fourth of July holiday. The creamy filling, crushed shortbread cookies and pie filling with cherries and blueberries make these delicious desserts in a jar so festive. In minutes you can have a special treat to enjoy at home, or pack them up and take them to a potluck or picnic for the Fourth of July. The cream cheese filling can be made up a couple days ahead, then simply assemble them the day you want to enjoy them. Desserts with fruit are always top on my list, and with Lucky Leaf Ready-To-Use Pie Fillings, you can have an impressive looking treat in minutes, while staying cool during the heat. The jars are half pint mason jars and can be found most anywhere you purchase canning supplies, like Walmart. Crush store bought shortbread cookies and add a few spoonfuls to the bottom of the jar. The filling, made with cream cheese, sugar and Cool Whip whipped topping can be spooned in or fill a decorator bag and pipe it in (I find this method to be easiest), a couple heaping spoonfuls of Lucky Leaf Pie Filling, then repeat the layers. Top with a large dollop of Cool Whip whipped topping and a sprinkle of crushed cookies and you have a special dessert in minutes. If you don't have jars or want to serve this in a regular dish, you can use a clear glass bowl or 13x9 glass dish also. Disclosure: I was provided products to review and bake with. As always, the opinions and photos are my own. My mason jars are a one pint jar size and I have to make fourteen of them. Can I use 4 cream cheeses and 4 cool whips to make the pints and can I make it all together?? I am making this tomorrow please let me know asap!! Hi Danielle, yes you can make the whole batch together, it should be fine. How much time can be prepared in advance? Hi Manon, yes you can prepare the cheesecake trifles in advance. I would not do them more than 24 hours though, or the cookie crumbs will get too soggy. And I would wait to add the final topping until before you serve. 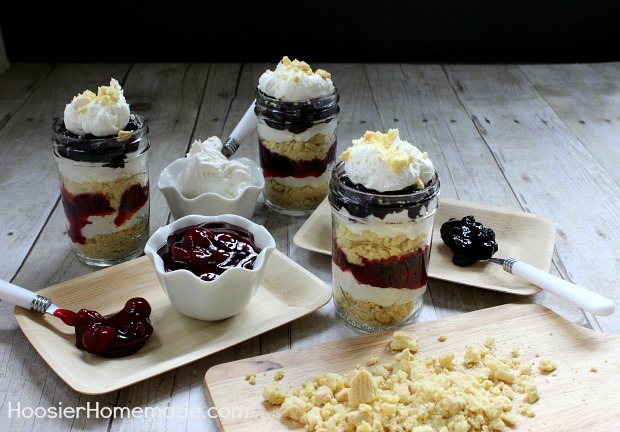 Hi Tricia, so excited you like the cheesecake trifles! I’m a fan of cherries and blueberries too! Just wondering how many jars this recipe makes. Hi Danielle, it totally depends on the size of the jar. The size I used, half pint, you can get about 6. What if I have my own fresh blueberries? Do you have a recipe for making the blueberry pie filling ourselves? I have one for a blueberry sauce, but I think it would be too runny. Hi Becky, sure you can certainly use your own blueberries. 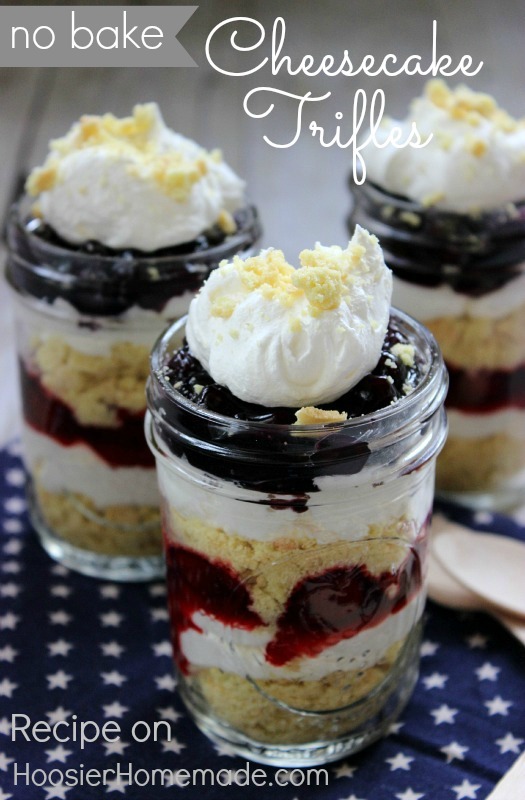 You can use just blueberries or make them into a filling. I don’t have a blueberry pie filling, but I have a cherry one >> http://pocketchangegourmet.com/homemade-cherry-pie-filling/ just substitute blueberries for cherries. The recipes calls for a can of cherries, but you could use fresh, and it calls for 14.5 ounce can, that would be almost 2 cups of blueberries. Hope that helps! Happy Baking! I hate to say this but those are half pint jars. Oops, you are right Marie, I missed typed that. Thanks!